I said there wasn’t going to be much posted here until sometime next year. If you didn’t believe me, I bet you believe me now though. But onto a different, and slightly more on topic subject. 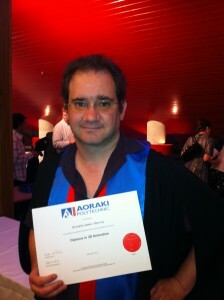 I passed my 3D animation course, and last night had my graduation in the town hall. My wife took a quick photo of me with a camera phone, something to remember it buy until the official photos show up.